Are you a manufacturer of soap or a homemaker's soap If you want to reduce the cost of your soap, join our SOAP making base course. 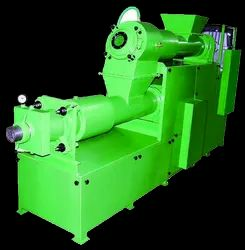 Our organization marked a distinct and dynamic place in this industry by supplying the qualitative array of Soap Sigma Mixer Machine. We are supplying wide array of machines which include Toilet Soap Making Machine. This product can be availed at reasonable market price. We would like to tell you that we deals in soap cutting machines for commercial purpose beside soap cutting machine we deals in soap melting machine, soap cutters manual and all the raw material of handmade glycerin soap making, to get the complete details you can contact us. we are the manufacturer of soap cutting machines, beside this we provides the training for soap making like- melt & pour soap making. cold process soap making, handmilled soap making etc..
- This unit consists of Soap Extruder, Soap Milling Machine, Soap Mixer and Soap Stamping Machine. - Capacity: 5000 Tons per year.